Falls of ground underground continue to feature in most sets of underground mining safety statistics. The term suggests, often wrongly, a major collapse of roof or sides but falls of individual but heavy, loose boulder or cobbles from a hanging position can equally cause death or major injury to anyone in the vicinity. Scaling involves the removal of dangerous, hanging rocks before they fall due to some unplanned action. Much depends on the type and condition of the rock being worked. As examples sandstone beds can produce large blocks from the roof, whereas shaley ground is often more friable with the possibility of large falls of much smaller but also hazardous lumps. Even in open-cut mining, scaling may be required particularly on high walls if they are expected to stand without further excavation for a considerable time. The other causal factor is the effect of blasting in which accuracy of peripheral cut holes may be important for safety, if not for production, and overcharging should be avoided for safety as well as economy. The best, and most widely adopted, strategy against smaller falls of ground is a systematic approach to removing the hazard, as soon as possible after a blast. Primarily none should enter a hazardous area before it is made safe. Traditionally scaling has been a manual practice using crowbars or specially designed scaling bars such as the range available from DSI (Dywidag-System International). These features moil or chisel points with solid steel, tube steel or aluminium bodies. Access and reach may often be problems; best carrying it out from a properly designed access basket starting from the last ‘permanently’ supported area and approaching the face one reach length at a time. Introduction of mechanised scaling makes it easier to adopt a systematic, and thus safer, approach to task, with improved speed to make it less laborious and improve overall mining efficiency. 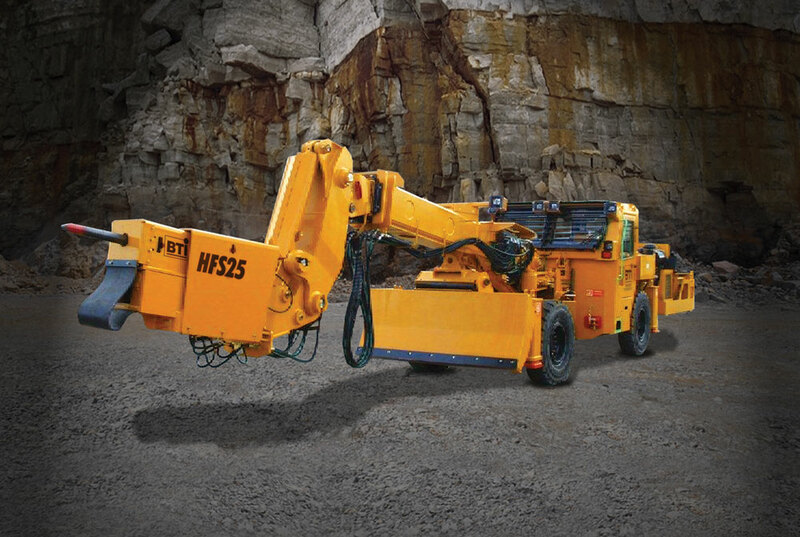 While standard designs of hydraulic, and sometime pneumatic, breakers are used for scaling usually mounted on an hydraulic excavator, the particular stresses of the task call for specially designed tools that can better stand the additional forces, and sometimes abuse, involved in the task. Intermittent scaling needs may allow the use of more standard breakers, such as may be used for face excavation, if the likely increased maintenance can be tolerated. Atlas Copco’s range of breakers includes scaler versions of the SB 302 and SB 452 ‘Solid Body’ breakers. The latest generation, introduced in 2010, has a higher blow frequency, with an automatic decrease if the tool is not pressed hard on the surface, thus decreasing unnecessary vibrations. A water channel for dust suppression, and automatic lubrication channel are housed within the breaker body for protection against falling rock allows you to spray water to reduce dust levels. 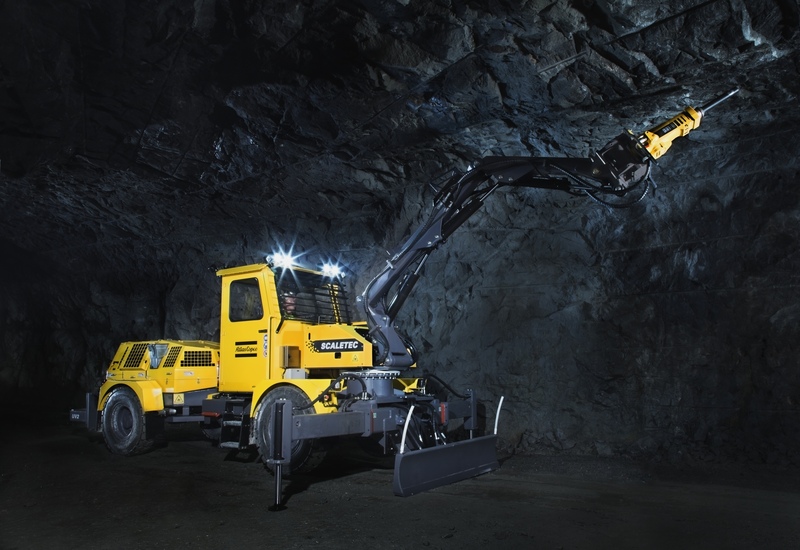 The same manufacturer’s dedicated mining scalers, a series of four models of Scaletec rig plus diesel-hydraulic versions, are enjoying increasing sales interest amongst mines wishing to step up both productivity and safety. New Boliden’s Tara Mines (the largest European zinc mine) in Ireland has been using Scaletecs since 2007 for routine scaling after every development blast. The rig allows the operator to work in a protected cab well back from potential falling rocks, and a dozer blade aids in clearing the worksite after scaling. 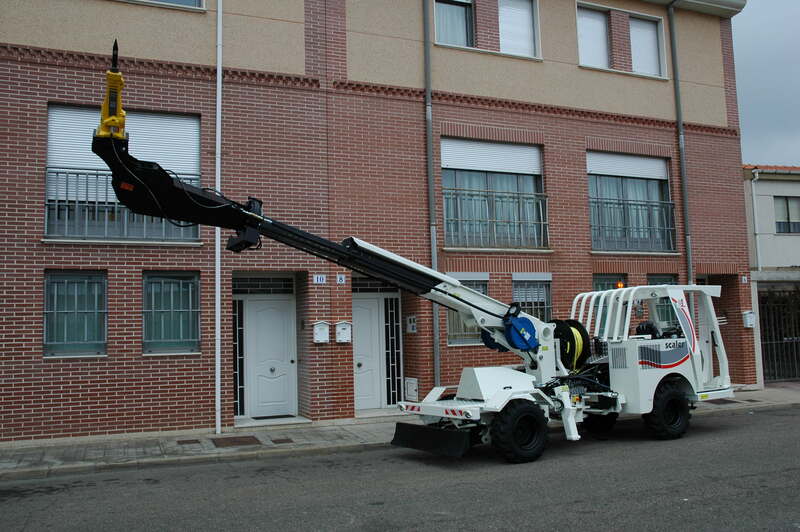 Models LC and MC include the Atlas Copco Rig Control System for accurate boom positioning. Rammer, part of Sandvik, offers a range of three scaler (breakers specially designed for scaling); the 555, 777 and 999. Gradall Industries offers scaling versions of it’s wheeled excavators employing its rugged, two-piece telescoping, triangular boom and hooked breaker for maximum leverage to further loosen hazardous rocks. The units are widely used in limestone mines in which the comparatively low profile of the excavators and boom mechanism allow easy operation under 6m headroom. 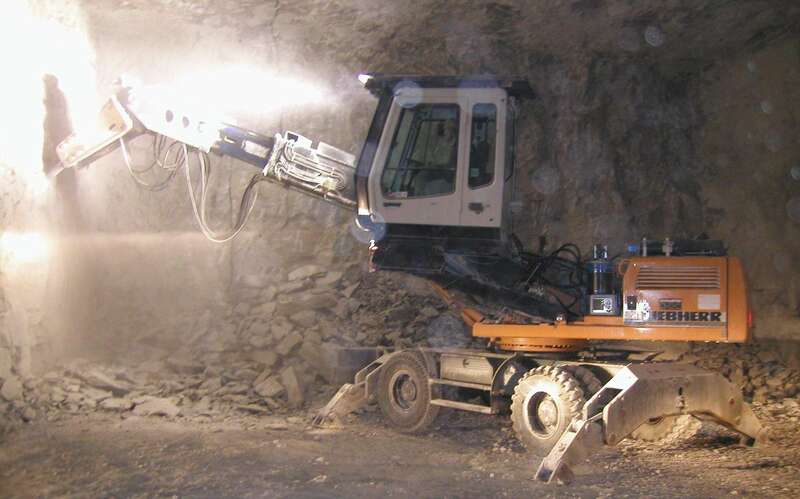 A possible way of avoiding scaling as a mining task which is, after all, largely non-productive, is to improve the accuracy of drilling and blasting so that hanging rocks do not remain after a blast. In mining accurate blasting is not often as important as it in ‘civils’ tunnelling, but this approach may benefit for permanent development and transport drives. A careful comparative study would be required to determine whether the increased cost of more sophisticated drill jumbos, probably with computerised control, and increased numbers of peripheral blastholes, can be justified over the best scaling procedures and equipment. Another avoidance procedure, if the ground is suitable, is to use a fully mechanised mining method such as a roadheader or continuous miner, cutting the required profile.